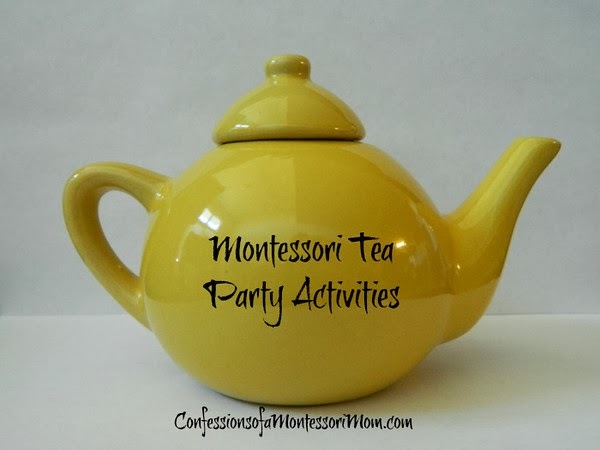 Montessori tea party activities including pouring, place setting, and tea parties. You will need a miniature or child-size tea set with teapot and lid, two teacups, two saucers, creamer, and sugar or honey bowl. The tea set in this blog post is from Montessori Services, Festive Ware China Tea Set, item #G425, and you can find it here, item #G425. Material: Teapot, lid, teacup, and saucer; a towel. 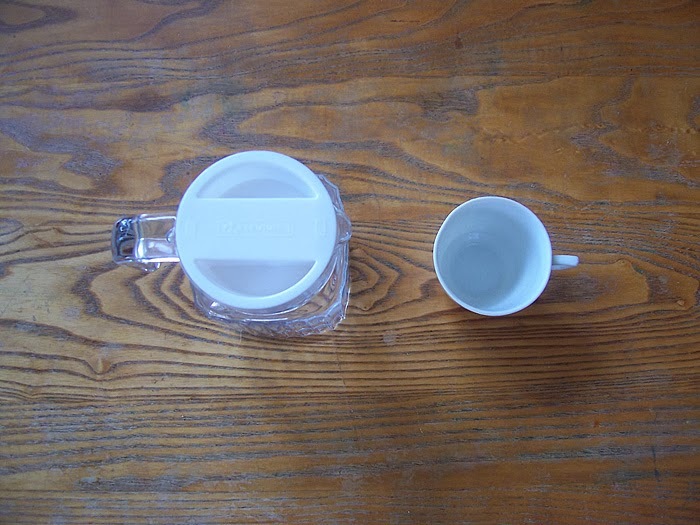 Water: Consider how your child will have access to water so she can fill up the teapot. If she does not have access to a sink (or if it is not feasible) you can have a dishpan with water pre filled. Place the pre filled dishpan on a low counter or tabletop, perhaps near the sponges or towels. The child then dips the teapot in the water. Towels: A small towel, like a washcloth, is necessary for this pouring work so have a basket of towels close by. Some classrooms have all their towels rolled up on a tray or in a basket so that each time a child takes a water material out to work with, they have to also get a towel for it when it is time to clean up. Keep in mind also that when the child is done with the material, she needs to put the towel in a hamper. Sponges: Some teachers prefer to use sponges, however, the child needs to learn how to squeeze out the sponge in a sink or tub. 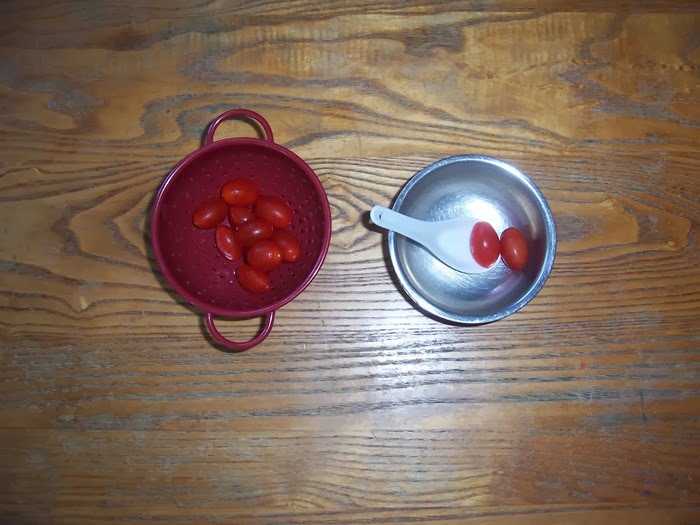 Also, younger children might squeeze out the sponge on the table, floor, etc., or will squeeze it out in the sink and try to get more water—this is a natural thing for them to do but it is recommended that you create a separate sponging work, have a water table, or some other water play available… You want this to be a pouring work! Have the tea set on a table pre set up or placed in a picnic basket on the floor next to a table then set out the tea set. "This is a tea set!" Point to the teapot, "That is a called a teapot, can you say teapot? And there is the lid." Point to the teacup, "That is a called a teacup, can you say teacup?" Point to the saucer, "That is a called a saucer, can you say saucer?" Stand up, tuck in your chair, get a towel, sit down—or remain standing, and point to where you spilled the water. Then wipe up or pat the spilled water with the towel and put it on drying rack or in hamper. Lastly, get another towel if you are keeping the towel with the tea set. You will probably go through a lot of towels—at the end of the day, pick out the dry clean ones! Or use a small sponge instead of a towel if you don't want to do a lot of laundry… Some classrooms have a towel washing work using an old scrub board! Now let the child have a turn! Material: Teapot, lid, two teacups, two saucers, mat optional, (no water). Mats: Some classrooms have all their mats rolled up on a tray or in a basket so that each time a child takes a material out to work with, they have to also get a mat for it. Keep in mind also that this method (of keeping the mats separate from the materials) means an extra step for the child! Many times the child will forget to go get the mat! Or they will leave it on the table and forget to put it away! 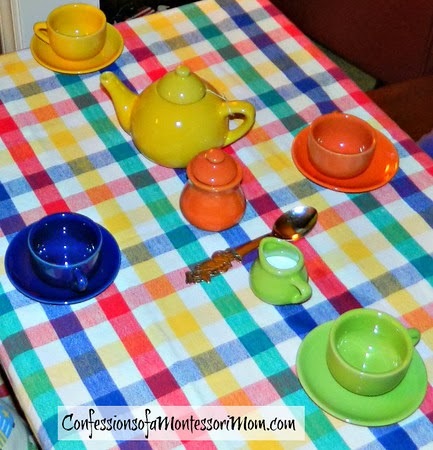 Have the tea set placed in a picnic basket on the floor next to a table. If you are using a mat slowly unroll it from left to right until it is all the way unrolled. Keep it placed horizontally. If the child is very young and needs practice unrolling and rolling mats, then roll the mat back up from bottom to top and let the child have a turn. Without talking, begin placing the tea set, one piece at a time, on the mat, from left to right, top to bottom: teapot, lid on teapot, saucer, teacup on saucer, etc. Then place each piece carefully, one at a time, back in the basket. Now let the child have a turn. If the child makes a mistake, just let it happen, then take another turn when they are finished! You can also give the language of the pieces of the tea set. Some teachers will then allow the child to pretend to have a tea party. Below is the Festive Ware China Tea Set, item #G425, from Montessori Services, and Marie used it to have a tea party with her family (see the photo gallery down below). It is more than likely two children will want to play this work together (a two-person work or material). If that is the case, the child who chooses the material (whose idea it was to play with the tea set) goes first to place the tea set on the mat, then put them back in the basket. She will then say to the second child, "Your turn." And so forth—if they get too silly or rough, it's time to put it away and do something else. 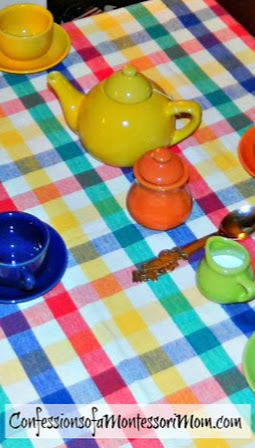 If three or four children are having a tea party, an adult should play too. Direct each child (one at a time) to get an item out of the picnic basket and place it on the table. Use real tea or juice in the tea pot. The youngest child goes first and the oldest child goes last (to pour). 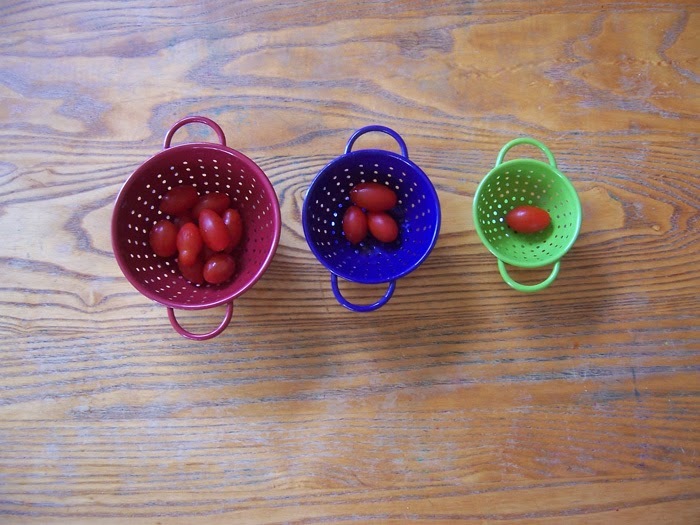 When the children are finished, place items one at a time in a dishpan or dishwasher and directed by the adult. Language: After the child has done this work a few times, take it out and give a Three Period Lesson on the names of the pieces. First, find out which pieces the child already knows! For example, take out the saucer and ask "What is this?" Child says, "Plate." You reply "This is a saucer. Can you say saucer?" Place it on the mat. Take out the teacup and ask, "What is this?" Child says, "Teacup." You reply, "Yes, this is called a teacup." Place it back in the box. Repeat with the remaining pieces. You will be left with the pieces the child did not know, sitting on the mat. You can then pick up the sugar bowl, for example and say, "Is this the sugar bowl or the saucer?" Child says sugar bowl. "Yes, this is called the sugar bowl." Pick up the saucer, "Is this the saucer or the lid?" Child says, "Lid." You reply, "This is the saucer." Put down saucer and pick up lid, "This is the lid." Materials: Pitcher and glass; kitchen towel or face cloth. 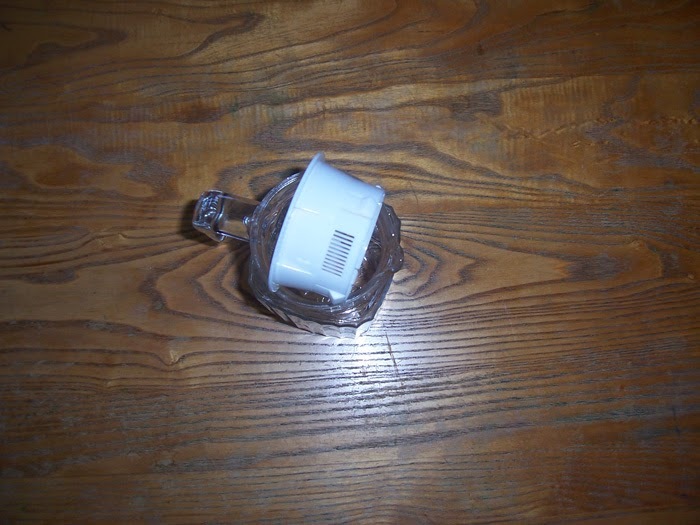 This glass pitcher is from Montessori Services and you can find it here, item #G274. My son loves his new glass pitcher! It is the perfect size for his hands to hold and pour; and the lid is sits snugly inside. We place it on our kitchen island with a towel underneath it; and sometimes in his table. Materials: Chinese soup spoon, bowl, colander. 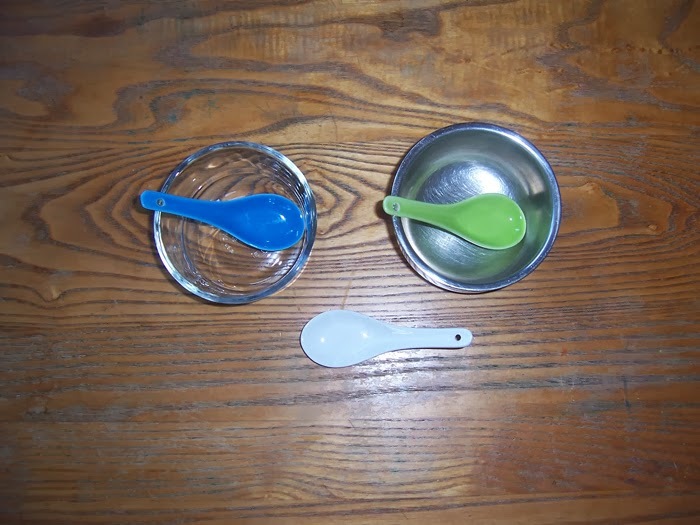 These Chinese soup spoons are from Montessori Services and you can find them here, item #G284. A Chinese soup spoon is the best "first spoon" for Practical Life kitchen activities. These spoons are great and I wish I got them sooner! My son uses them for his favorite soup, chicken noodle; eating yogurt; and eating applesauce. 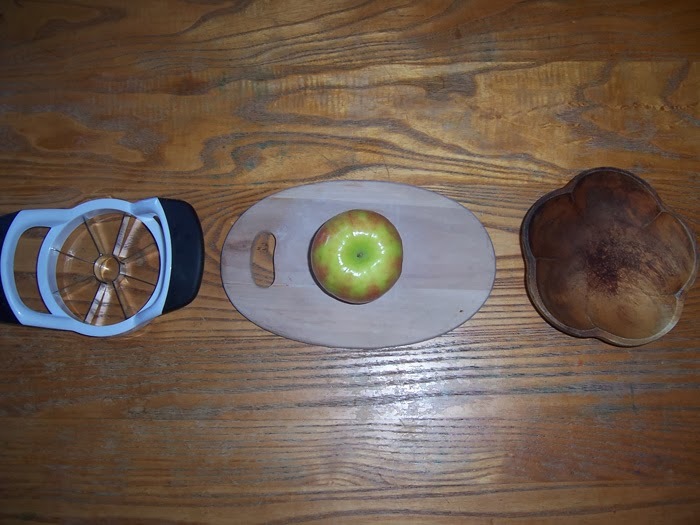 Materials: Apple slicer, cutting board, bowl, and wet sponge or face cloth. This apple slicer is from Montessori Services and you can find it here, item #D318. My son loves to practice slicing apples with his new apple slicer! It's handy for older siblings to help younger siblings or Mom and Dad! 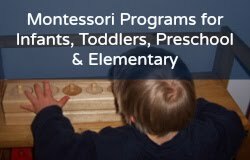 Please note: We received these items at no cost from Montessori Services, and with whom we are also affiliates. We get a small commission if you make a purchase from the links provided. Thank you!